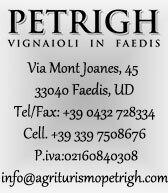 The Petrigh Denis, David and Svetlana Vitiuc farm is located north of Faedis and is actually quite young in agrituristico but was well assured that the typical host of boughs of a time to relax you and forget the hectic pace of our day. Here you can taste the homemade dishes, sausages produced in farms owned, the traditional cheese course and the wine produced in our Faedis vineyards. We have 2 mini-apartments for anyone who wanted to spend a few days in complete relax and will be made available to the bicycle for a picnic. 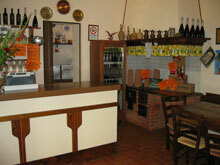 Do not forget to visit us and for reservations or have any questions please contact us through our contact details. The cuisine is served by reservation from Friday to Sunday. For hygiene reasons, pets are NOT allowed in the restaurant area and in the apartments.